Living in Michigan, winters can be tough. However, one refreshing event every year is the North American International Auto Show. In 2020, the festival is moving to June instead of January, which should bring even more activities and attract more participants. This year, nevertheless, was well attended. After naming the North American Car, Utility and Truck of the Year award winners Monday, press members made their way into the various exhibits. 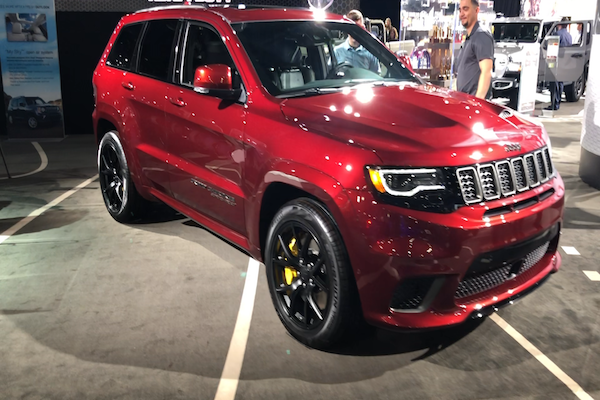 TheStreet ran into the Jeep display, where we saw the Jeep Grand Cherokee Trackhawk. If you thought a four-door Wrangler Rubicon was expensive, this boss starts at a whopping $86,650 and can run up to six figures with all the options included. That said, its specs are nuts. The car can go from 0 to 60 mph in just 3.5 seconds and comes packed with 707 horsepower churning out 645-lb ft. of torque. This thing is a total beast. To put this in perspective, the Grand Cherokee Trackhawk has about as much horsepower as Ford's (F - Get Report) most powerful street-legal Mustang and could beat a Mercedes-Benz (DDAIF C63 AMG in a 0-60 sprint by three-tenths of a second. This type of performance out of a Jeep is...abnormal to say the least. The power comes for a 6.2-liter Hemi V8 engine and comes with an 8-speed automatic transmission, which Jeep calls the "quickest SUV ever." The car can be driven in various modes, including sport, snow, track, auto and tow mode. But it's not all about performance, some of it's about looks, too. Branded with the words "Super Charged" on the side, four black chrome exhaust tips and 20-inch chrome wheels, the Trackhawk will definitely turn a few heads on the road. Inside, drivers and passengers alike will enjoy heated seats in both rows -- a treat especially around this time of year! Drivers will benefit from LaneSense, a lane-keeping assistant, active braking and adaptive cruise control. When you're done driving, its Front and Rear Park Assist system and parallel park assist should make parking a breeze. It's a hefty price tag, but Fiat Chrysler's (FCAU - Get Report) Jeep is taking a page from automakers like Ford, General Motors (GM - Get Report) and others charging huge sums for big SUVs packed with awesome features. Let's see how it treats them in 2019.